Today is the first installment of a three-part series I’m doing on inexpensive, yet still fun and creative and useful, Christmas gifts. The goal is to give items that would be a welcome gift and not just junk that will likely be tossed out at the end of the day. To be included in this gift guide it must be useful, lovely, and budget-friendly. Today, Thrifty Stocking Stuffers, and later this week, Thriftier Stocking Stuffers, and last but not least, Thriftiest Stocking Stuffers. Instagram magnets: for $14.99 Stickygram will create 9 magnets out of the Instagram photos of your choice. 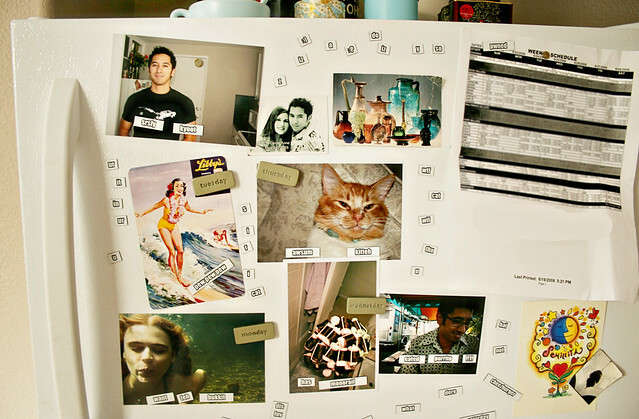 My plan is to do this and split the photo magnets among family members. Phone cords: for whatever reason, the necessary USB cord for the iPhone seems to always crack and wear, leaving exposed wires that result in a poor connection. I could always use an extra USB cord, and for that matter, extra screen protectors and replacement ear buds (they always find their way to the washing machine at our house) make handy stocking stuffers, as well. Flash drives: I’m lusting after this key-style flash drive. Particularly useful for students and nerds! Especially useful for nerd-students. My Etsy shop: Shameless self-promotion time! In my shop I have a number of smaller items that would make excellent stocking stuffers. Support small business and an active reuse market! 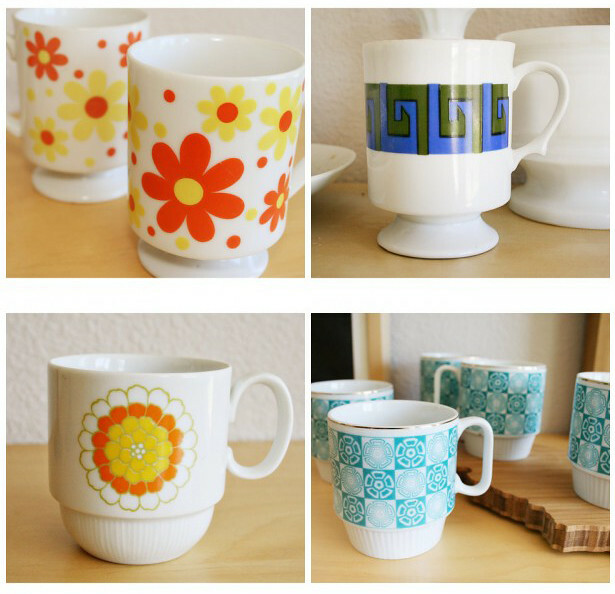 Also, my thrifting habit. Books: The thriftiest way to give books is to give away books you no longer want to keep (which I’m cool with as long as the recipient would be interested in it), or to find something while thrifting or at a library book sale. But don’t forget independent book sellers or even mass-market retailers. My dear friend Stefanie loves to give books at holidays and we all look forward to getting them. Personalized calendar: for as long as my mother has purchased calendars she’s always had a cat calendar every year. Somewhere along the line Anthony and I started purchasing calendars for her as our Christmas present. After a couple years I had the idea of making her a cat calendar using photos I took of her own cats, and she loved it. When Isobel came along we made her cat and granddaughter calendars. She looks forward to this every year. Shop Etsy faves: If you do happen to have a budget for presents, and the person you are buying for has an etsy account, take a look at items they’ve favorited through their profile for ideas. My friends and I started using Etsy faves as a wishlist and like to buy items off their lists when we can afford it. We know they’ll love whatever we buy them, and since we all know about this idea we include faves at a few pricepoints. We have had the issue of two of us buying the same present for someone only once (since faves aren’t an actual registry, after all) and overall this system works well. I love supporting small biz while making a friend happy. 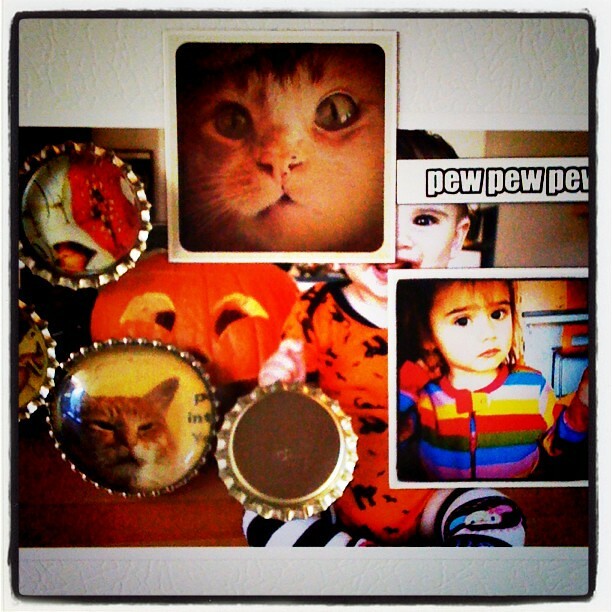 Magnets: I always need more magnets, Instagram or otherwise, and by this I mean cute magnets, of course. Gift cards: Gift cards aren’t an usual gift idea, but when times are tough sometimes the best gift someone can receive is a gift card for some much-needed clothes or a luxury they wouldn’t purchase for themselves otherwise. When my cousin had her second child, my Aunt Kay said she’d by her the gift card of her choice: a mani-pedi, a massage, or one month’s worth of a housecleaning service. (For the record, my cousin chose housekeeping. I would have, too!) I like to buy gift cards for iTunes, Target, Amazon, Old Navy, or our local favorite sushi restaurant. Dishtowels: It’s common knowledge that I’m a dishtowel junkie. They are an inexpensive way add style to a kitchen—a room that’s hard to change without major remodeling. And they fit in a stocking perfectly, too. Mouse pad: It seems like mouse pads have a short shelf life before they get all faded and gross-looking. Adorable options abound on Etsy. Cute socks: Perfect for winter, warm, cute socks are always welcome in a stocking. Today’s installment was for those of you lucky enough to have a budget, but what if your budget too strict for this gift guide? Never fear, later this week I’ll be coming out with two more gift guides for really-low and even no budget gifts that still meet the lovely and useful criteria. Stay tuned! These are great ideas. I realized I may need more stocking stuffers for our family/adults than I had planned yesterday & had no idea where to start. I am making Romy her own Facebook album for her stocking. I have a 99 cent album and am putting in little printed photos of her from day care, with her friends at the park, her cousins, etc. I have stickers for the front to spell out Facebook. I’m also making her play-doh and throwing in some stickers I’ve had saved. Aw, that is such a cute idea! I’d love to see a photo. The ones I have for you later on are even more budget-friendly! Cute ideas! 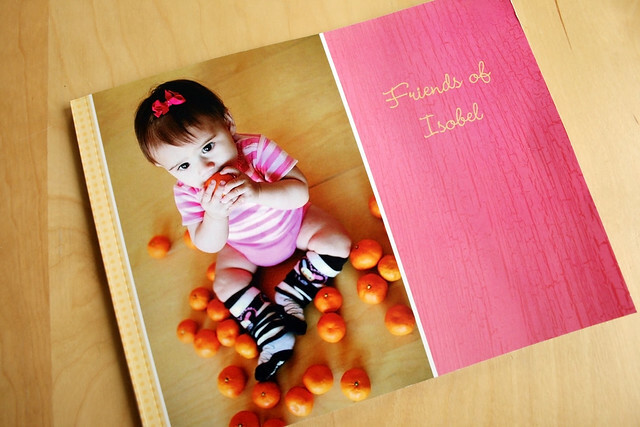 I love the personalized calendar and photo albums ideas. Wow, that was fun to type.